"...while asleep in the trenches." ""Last week a party of fifty Boers surprised the volunteer company of the Berkshire Regiment while asleep in the trenches. The first intimation of the presence of the enemy was when the Boers woke them up and demanded their arms which were surrendered." The officers have been placed under arrest, pending a court martial." This was a unique event in the war, and very shameful for the British Army. Looking into the casualty rolls the names of these men are not recorded. Fortunately, the Army kept a record of every surrender that occurred as each was inspected to ensure officers and men made every effort to resist the enemy. These records are published as South African Surrenders, War Office 1905, a copy is available at the National Archives under WO108-372. The incident occurred on October 28, 1900 at Holfontein Siding in the Orange Free State. Such was the scale of the surrender and the circumstances it merited a special account. Holfontein Siding is 30 km south-west of Kroonstad on the line to Bloemfontein. The volunteer service company commanded by Cpt AF Ewen entrained at Kroonstad with orders to go to Holfontein. On arriving there they were informed by the Commandant, Cpt RE Watt, 1st bn Oxfordshire Light Infantry, to proceed to Holfontein Siding 4 miles further and dig in. Their departed and on arrival his men began digging trenches. The ground was very hard and progress was slow. Patrols were sent out and sentries. In the evening a big storm erupted which did not end until the early hours of the 28th. At 4am a patrol was sent out which shortly returned the news that cavalry were approaching the camp. Cpt Ewen saw the approaching horsemen were dressed in kakhi and wearing slouch hats, when they were about 100 yds they shouted "Hands Up". Ewen could see there were just a handful of his men in the entrenchments and only two had rifles in hand, everyone else was asleep, rifles piled in neat stacks. Faced with an estimated 300-400 Boers he had no choice but to surrender. The volunteers were rounded and marched off to be stripped while others looted the camp removing arms, ammunition, food and anything else they fancied. From the south an armoured train could be heard which opened fire on the Boers who rode off. Shortly afterwards General TC Porter rode up with his staff, the 3rd Cavalry Brigade were in the neighbourhood. Ewen was bought before a court-martial on November 20 at Bloemfontein charged with; "that he shamefully delivered up a post to the enemy" and "he was taken prisoner by want of due precaution". The court asked why the men were not stood to at daybreak, Ewen replied he did not think it was necessary. The court found Ewen guilty of the second charge but not the first, the sentence was a severe reprimand and forfeiture of any campaign medal. Lord Roberts approved the court's decision. When the War Office reviewed the case it confirmed the sentence and added that Ewen forfeits his war gratuity. The medal roll shows Ewen was awarded a QSA medal, whether it was recovered is not known. The names are not probably recorded in the casualty rolls because they were only prisoners for a short period, even though they lost their arms and ammunition. I have added their names to The Register, the medal roll clearly shows the volunteer service company headed by Cpt Ewen's name. There are 130 names (excluding those who died before this incident and Lt WP Alleyne who served as a Railway Staff Officer, Bloemfontein). 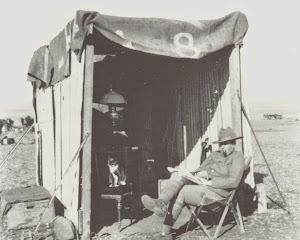 Ewen's military career was not unduly upset, he continued to serve in the volunteers and then the Territorial Force before he resigned in 1911. He re-joined for WW1 serving at home as a Major (temporary). I recently purchased a QSA medal single clasp for "Relief of Ladysmith" to Trooper 1786 FD Hester Natal Police. The dealer supplied verification from the medal roll confirming the single clasp. A nice medal with an unusual single clasp. Of course not. Research is never absolutely, completely done. Using The Register I looked the recipient up - before purchase of course and discovered that the man was entitled to two further clasps, but more excitingly he served in three other, rather special, units and was captured in a very nasty ambush late in 1902. When the medal arrived I was surprised and amused to see the medal roll verification came from myself in 2008 that I did for a different dealer. Back in 2008 the medal rolls were not on Ancestry, I was using my own micro-film copy; old fashioned page by page research. The details on the medal led me to page roll 261 page 130 for the Natal Police which confirmed the single clasp and the remark "discharged 26-01-1901". I could not find Hester on an Extra Clasp roll for the Natal Police. To all intents and purposes Trooper Hester's role in the war had ended. Clasp confirmed, research completed. The Register is a fantastic resource making the most of modern technology - namely the database. Whereas Ancestry's medal roll index is simply a list of names from the rolls, The Register connects all the references to a single recipient in one place. Looking up Trooper 1786 FD Hester Natal Police shows you the gold dust hidden in the rolls and information from casualty rolls and other sources that turns a "nice medal" into a sensational QSA. Following discharge from the Natal Police in 1901 Hester served as Sgt 6 Utrecht-Vryheid Mounted Police and in Loxton's Horse. In 1902 he enlisted for the Special Squadron, Steinaecker's Horse. All three units were composed of hard men who were intensely disliked by the Boers. Loxton's Horse was a shadowy "loot corps" formed in secret by Lord Kitchener to wage economic warfare on the Boers. Very little is known about Loxton's Horse, only two men appear on the medal rolls under that unit name. I have constructed a history and nominal roll. Serving with Steinaecker's, on April 16, 1902, Hester was part of a large patrol sent to raid a Boer laager. The laager was empty but Boers were spotted near by, giving chase the patrol followed the Boers into a narrow defile where others Boers poured a heavy fire into them. Six men were killed, 16 wounded and 31 captured. Hester was posted as "missing, rejoined", he may have been captured and released or simply escaped the carnage and made his own back to base. A terrific story, enough to grace any medal. But, research on his full name, Francis Danby Hester, reveals a Sergeant 4908 Francis Danby Hester 3rd SA Infantry, 1st SA Brigade - missing presumed killed between the 15th-20th July 1916 at Delville Wood on the Somme, France. Delville Wood is the iconic battle for South African forces in WW1 - huge casualties were suffered as they hung to a chunk of earth defying German efforts to capture the ground. When relieved on July 20 the 1st SA Brigade mustered just 750 out 3153 men - a 76% casualty rate.